It's official: Brian Fenton will not be taking personal charge of any PR campaign to promote his own claims to become Footballer of the Year. "I wouldn't think so," he modestly counters, when asked if 2018 has been his best season yet in Sky Blue. Then again, the competition (from 2015 to '17) was at a pretty stellar level. October may be the month for presidential candidates taking pot-shots at each other, but clearly it's not like that in the Dublin dressing-room. 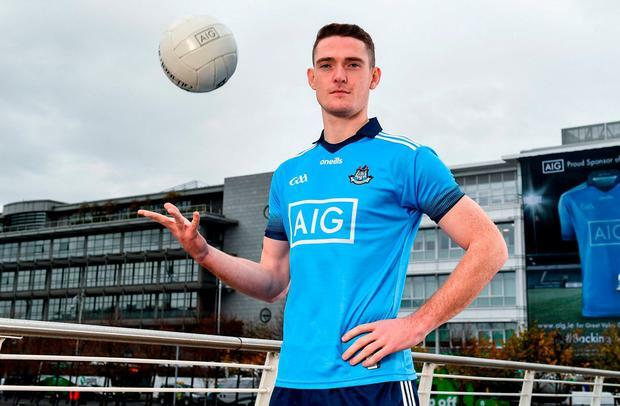 For Fenton, to be nominated alongside Ciarán Kilkenny and Jack McCaffrey for the senior award, and to have Raheny clubmate Brian Howard on the shortlist for Young Footballer of the Year, is "pinch yourself" stuff. The towering midfielder, 25, is one of three Dubs nominated by the All Star selectors for this year's top individual award at the PwC All Stars banquet on November 2. Now it's up to their inter-county peers to decide who should take home the prize. But Fenton is no Donald Trump; blowing one's own trumpet is the last thing you'll get. And although he revealed a new prolific streak last summer (scoring 1-13 in seven appearances, compared to 0-11 over his first 20 SFC starts) this is not what he looks for when it comes to critical self-analysis. "If I actually look at my stats, it was probably lower in possession in general than other years," he points out. "I think there is a tendency, if you are on the scoreboard, you are sort of in the limelight a little bit more and that's probably what I've noticed this year. "I've scored and maybe you are getting good matchday reports. I think it's just every time you are trying to get on the ball as much as you can. You are trying to chip in with a score, of course, if you can. But you are also trying to defend and make blocks and interceptions and all that stuff. "Thankfully it's been a pretty consistent level over the years. If you were to break down and look at stats, kickouts and all that sort of stuff ... that's what I'd base performance on, rather than just, 'Ah Jesus, wasn't he great, he scored a point here, two points there', whatever. "Thankfully it's been consistent and long may it continue." Leaving aside personal performance, an even more consistent trait has been Fenton's peerless record of never - ever - tasting championship defeat. Since making his summer baptism against Longford in 2015, he has started 27 out of 28 SFC outings, winning 25 of them and drawing twice, both against Mayo. Another reason to pinch himself. But while Fenton has enjoyed his off-season over the past month and more, even taking in a trip to Old Trafford last weekend, the focus won't be long turning to next year. And the big elephant in the dressing-room: five-in-a-row. He accepts that this will bring more hype than ever before. "But not amongst our group," he stresses. "Not amongst the players. "I know certainly Dubs fans, we've all had it mentioned to us already. But for me, in terms of football, it's about trying to have a rest, first and foremost. Then finish up a few games with my club, Raheny. The training schedule wouldn't be as intense compared to our time with Dublin. Have a bit of a rest, hopefully avoid relegation in Division 2 with Raheny and try have myself in a good position going into next year. "It's very important to enjoy the downtime; it's very important for all sorts of aspects of your life, mental health and the whole thing, so it's nice to get the break. And then put myself in as strong a position as possible to wear the jersey again next year. "It hasn't been talked about amongst my own personal friends on the team or the group in general ... we certainly won't be looking past the National Football League." Not that Jim Gavin would even let them. "From a management point of view they never address two-in-a-rows, three-in-a-rows, four-in-a-rows," Fenton confirms. "They're called Leinster Football Championship One, Leinster Football Championship Two and that sort of process. "So it's never been mentioned, the whole in-a-rows. And I can't imagine next year being any different - I think it's going to be National Football League One and from there on." The same league campaign is likely to include some, if not all, of the experimental rule changes proposed by the Standing Committee on Playing Rules. Fenton doesn't view these radical changes (to the kickout especially) as an attempt to halt the Dublin juggernaut. "It's well publicised that attendances were lower and viewership was lower. So, I think it's not just us having won the last few years; I think it's a broader picture. I wouldn't (see it) as a dig at Dublin or anything, certainly not." Fenton would have preferred to see a current "player or two" involved on the original committee but he's happy to give the experiment a fair shot. "Trial it out; see how it goes. If it can help the game in any way," he concludes. Peering ahead to next summer, he expects both Kerry and Mayo (under new managerial command) to redouble their efforts to knock Dublin off their perch. "You just look at the Kerry lads and the (minor) success they've had, it is daunting, really," he warns. "And they have put a serious management team in place. "I am sure Mayo were frustrated with how their year ended. I know I would be if Dublin were knocked out early. James Horan is coming back and just from listening to him in punditry, he knows the game inside out." Before all that happens, there's a special All Stars night ahead, not just for the all-conquering Dubs but for Raheny. The two Brians attended the same primary school (Scoil Assaim, Raheny) and the same secondary school (St Fintan's Raheny). Both are seen as All Star shoo-ins. "The club are trying to round a few bob together to get a table at the All Stars, to be there and enjoy the occasion on behalf of the club," Fenton explains. "It's incredibly special and likewise for the player of the year. I played against Jack and Ciarán from under-eight. I was with them on development squads from under-12. I know all their families and just the connection that's there and to be nominated with them is incredible. "With Brian, the two of us being nominated, and hopefully he goes up the steps to collect that (young footballer award). It's just pinch yourself stuff, genuinely."